The 404-room, four-star hotel opened on-time despite challenges posed by the airport’s underground tunnels, access bridges and TSA screening facilities. Plan B Holding’s founder Ed Schrank provided on-site development management services for the $82 million hotel at the Detroit Metropolitan Airport. With underground tunnels, access bridges and proprietary TSA screening facilities, the Weston Hotel provided many logistical and structural challenges. The Hotel opened on time in December 2004. 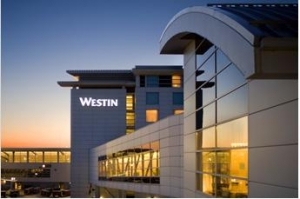 The 404-room, four-star hotel was an immediate success as a fly-in meeting destination. With 28 meeting rooms and a 7,500-sf ballroom, the hotel is able to provide a sophisticated environment supported by leading edge technology and the finest logistical and culinary support. Specialty windows and siding systems were developed to keep the jet engine noise on the outside. All fresh air is charcoal filtered to eliminate fuel smells within the hotel and all kitchen exhaust is scrubbed of smoke and grease before discharge to the outside.